Research into organizational ambidexterity has sky-rocketed over the past 17 years, and with good reasons. I’d venture to say that it is more relevant now than ever before. Why? Because organizations are caught in a perfect storm of conditions that means they have to replicate the basis for their success today while at the same time being willing to change and abandon past truisms to shape an organization fit for the future. This, of course, is extremely hard. Get it right, and the organization survives and potentially prospers. Get it wrong and the organization will downward spiral into mediocrity and irrelevance, with failure closely in tow. So why is it so hard? To answer that we need to think about “what” organizational ambidexterity actually “is”. This is not an easy question to answer. So, some fundamentals: organizational ambidexterity is a metaphor that in part anthropomorphosizes the organization into the human analogue of performing two different tasks equally well. Typically, we mean exploitation and exploration. Exploitation is the ability to refine and improve current activities to reproduce success; exploration is the ability to develop completely new activities that instil variety into the firm. We need these to occur simultaneously and to a good standard for the organization to become ambidextrous. Too much exploitation and we risk a success trap: repeating the same recipes, investing in the same products, services, resources and capabilities, and so on. This is addictive and is associated with inertia (an object’s resistance to change direction despite pressures or forces acting on it). Too much exploration and we risk a failure trap: seeking novelty for its own sake and waiting for the big hit that may never come or fail, leading to a cycle of yet more exploration and risk-taking as the failure triggers yet more search for novelty. The two are also symbiotic to an extent: exploration is resource intensive and exploration may bring in the revenue that finances exploration. Why is achieving organizational ambidexterity difficult? The problem is these two things are very different. Exploitation is about doing more of the same, only better. Exploration is about doing less of the same and replacing it with new things. Exploitation is addictive: we know it works, making it better is cheap, and it relies on streamlining and efficiency. Exploration is uncertain, its payoffs are often unknown and risky, and getting there means using resources to experiment and discover new things. One school of thought (e.g., James March, Michael Tushman and Charles O’Reilly) says that each one needs very different systems and processes to the point that they cannot be reconciled in one firm or unit. So, we structurally separate them into their own business units or functions and coordinate them. Another school of thought sees this tension as a starting point (e.g., Julian Birkinshaw, Zeki Simsek) and we need to create a context that allows high levels of both activities to take place simultaneously. A third view (e.g., Dovev Lavie, Anil Gupta) suggests that these activities may occur within and beyond the boundaries of the firms and even cycle iteratively over time. And after all this we are still left with the question of at what level all this occurs! What are the fundamental elements of organizational ambidexterity? 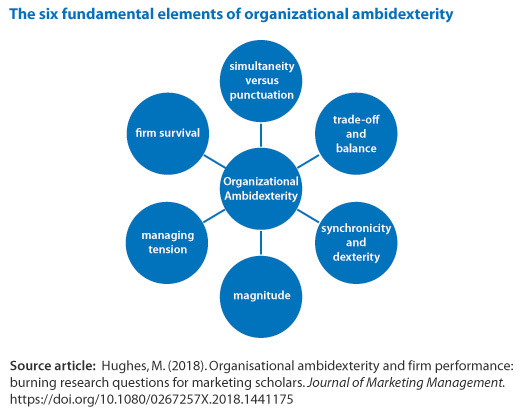 There are six fundamental recurring elements to organizational ambidexterity that we must appreciate if we are to understand it and treat it correctly (see figure 1). How can we best study organizational ambidexterity? 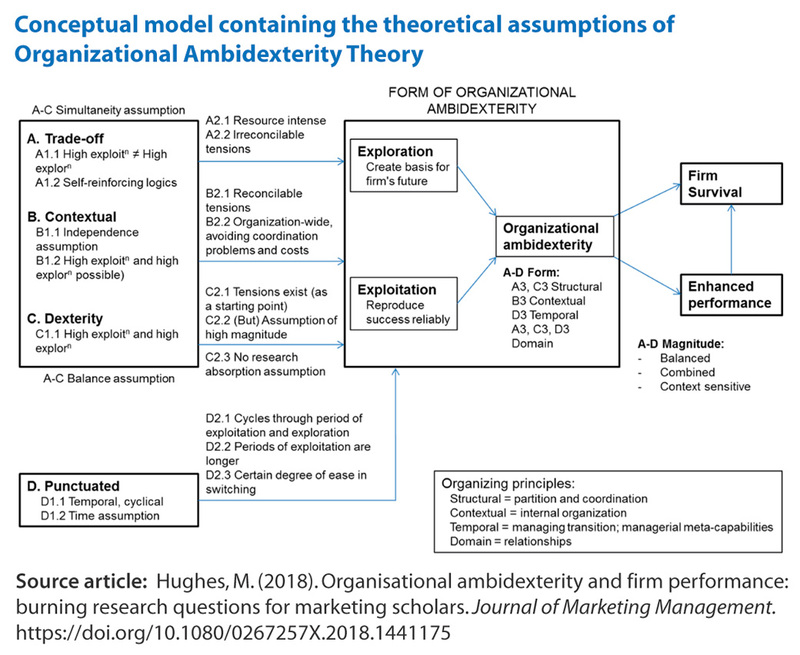 To study or implement organizational ambidexterity, it’s vital to understand your assumptions, made consciously or consciously, about organizational ambidexterity and what these mean for its form and use (see figure 2). To be entirely blunt about things, many studies exist that do not acknowledge their underlying assumptions. And because there are so many different and often competing views of ambidexterity that cross from the firm to the individual to alliance and to even the network as level of analysis, with the unit of analysis varying from its traditional home in organizational learning and innovation to include strategy, routines, competencies and marketing activities, we run the risk of failing to develop or accumulate a cohesive body of knowledge with clear guidance for managers and clear differences between its forms in scholarly investigations. Increasingly, we acknowledge that organizational ambidexterity requires treatments at the firm level to organizational structure and design but also at the individual level in terms of people skills, leadership and jobs. We also recognize that we might not need to do everything in-house or that it applies at every part of the firm. What we do not know is whether these aspects can come together (because each has a starting point with a very different set of assumptions (see diagram above). In my paper, I identify 17 burning research questions for the urgent investigation of organizational ambidexterity! Understand the position and priorities of your company. Understand the context of your company as the route to ambidexterity is not inherently the same or optimal for each organization. Analyse what conditions, structures and activities (including rewards and incentives) prioritise either exploitation or exploration in your organization. Play the long game, not the short game. Engage scholars: ambidexterity is difficult and messy, but essential. Hughes, M. (2018). Organizational Ambidexterity and Firm Performance: Burning Research Questions for Marketing Scholars”, Journal of Marketing Management. Mathew (Mat) Hughes (@M_Mat_H) is Professor Entrepreneurship and Innovation at Loughborough University School of Business and Economics (@LboroSBE). He is an expert in the strategy and management of entrepreneurship and innovation. Mat publishes widely in excellent journals on these issues and works with several organisations. Google Scholar page.